Auxerre is a commune in the Bourgogne region in north-central France, between Paris and Dijon. It is the capital of the Yonne department. It is a commercial and industrial centre, with industries including food production, woodworking and batteries. 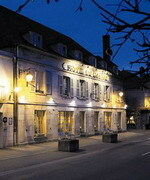 It is also famous for the wine produced in the neighbourhood, including the renowned Chablis. Located on the banks of the Yonne River, hotel Le Maxime is a charming and authentic property situated in the heart of Auxerre, town of Art and History between Paris and Dijon. Thanks to its enviable position, this city hotel is within walking distance of major Auxerre tourist attractions, such as the cathédrale St-Etienne, the abbaye St-Germain and the Eglise Saint-Pierre. The property is also an ideal solution for guests wishing to discover museums or typical restaurants and namely sample the renowned Chablis wine. With a bar, cellar, wireless Internet access and extensive parking facilities, hotel Le Maxime offers its guests the possibility to spend an enjoyable stay in Auxerre. 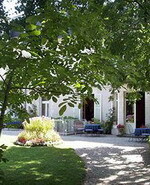 In Burgundy, the “Parc des Maréchaux” a delightful hotel of character with 25 rooms, practically in the heart of Auxerre, is a preserve of gentle tranquillity, a true haven of peace, surrounded by hundred-year-old trees in a vast garden. The architects of Napoleon III didn’t know that some of their beautiful private mansions were to end up as hotel. Practically in the heart of Auxerre The ‘Parc des Maréchaux’ with its gentle tranquillity and surrounded by the hundred-year-old trees of the vast garden, is a veritable haven of peace. There is now a bar beneath the Victorian mouldings in each of the stylish lounges. Avignon is a commune in the Vaucluse department in south-eastern France with an estimated mid-2004 population of 89,300 in the city itself and a population of 290,466 in the metropolitan area at the 1999 census. The city is well known for its Palais des Papes (Palace of the Popes), where several popes and antipopes lived from the early 14th to early 15th centuries. Avignon Grand Hotel is a stunning new 4 star residence located in a wonderful setting in Avignon, close to the Pope's Palace and famous Bridge. 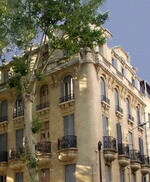 This charming Avignon hotel combines comfort with elegance for an altogether unique experience of pure luxury. 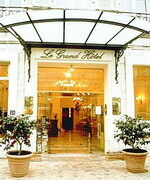 ccommodation in Avignon Grand Hotel is offered within a selection of well appointed rooms, suites and luxurious apartments. Avignon Grand Hotel offers a full complement of hotel facilities ranging from in house dining, leisure and business facilities making the Avignon Grand Hotel an ideal choice for both business and leisure travellers. Rue de la République, the main street of Avignon, is, without a doubt, the heartbeat of the city. Located midway between the "Palais des Papes" and the medieval ramparts, REGINA HOTEL is truly a ring site for watching life go by this active city. 30 rooms are all different, with large windows and very high ceilings. All rooms have character, by opposition to the standardized rooms of modern hotels. The hotel has an elevator. They benefit from all the current comfort (toilets, flat TV screen, phone, wifi). 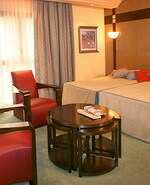 10 of our rooms are air-conditioned ( the superior floors). A triple room and two quadruple rooms are available. Breakfasts are charged 8 euros in dining room and 9 euros in room. Avranches is a commune in the Manche department in the Basse-Normandie region in north-western France. It is a sub-prefecture of the department. The inhabitants are called Avranchinais. Avranches is situated at the southern end of the Cotentin Peninsula on the E40 road connecting Saint-Lô with Brittany and on the rail line between Lison (linking to Caen) and Dol (linking to Rennes). The town was founded on high ground overlooking the dunes and coastal marshes along the bay forming the corner between the peninsulas of the Cotentin and Brittany. From Avranches, it is possible to see the Mont Saint Michel, which was founded by Saint Aubert, Bishop of Avranches in the 8th century. 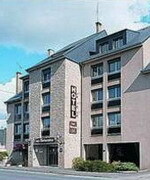 The Hotel le Relais du Mont is a modern hotel built in traditional Breton style, with exterior walls in grey stone and whitewashed plasterwork; it is located 15 kilometres from Mont-Saint-Michel. The 35 guestrooms are decorated in a cheery style, with dark wood and fabrics in bold floral patterns. In the Restaurant Le Relais du Mont, guests can order traditional Breton dishes and local produce; the dining room is traditional in style, with wood-beamed ceiling and high-backed tapestry-covered chairs. The wood-lined Lobby Bar is open daily for coffee and drinks. Guests with children can ask the staff for assistance warming up children's meals, and there is a small play area for children in the hotel grounds. The hotel offers complimentary parking for those arriving by car. Amenities include complimentary wireless Internet access, room service, and safe deposit box at the front desk. Rennes Saint-Jacques airport is 90 kilometres away. 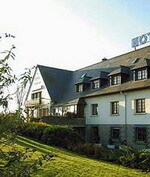 In the heart of the bay of Mont Saint Michel, within walking distance from the city centre of Avranches, Hotel Altos is a first choice hotel for the business travellers and the many tourists visiting the Basse-Normandie region, in France. his modernly designed property includes spacious guest rooms, a lounge bar and also a restaurant (separately managed). Parking facilities with entry code. At Hotel Altos the clients will enjoy the warm hospitality of its staff who provide useful information about the activities and tourist interests of the Cotentin area: from Mont Saint Michel to Saint Malo, and the sandy beach in Granville. Worth noticing: the opportunity to go and visit Jersey Island (UK) by taking the ferry in Granville. Bagnoles-de-l'Orne is a commune in the Orne department in north-western France. This commune is famous for its hydrotherapic baths, which are known for their healing powers for rheumatic, gynaecologic and circulatory problems. The origins of thermal activity are said to date back to the Middle Ages. Local legend tells of the medieval lord Seigneur Hugues de Tessé. As he felt he was reaching the end of his life he decided to abandon his once-glorious horse "Rapide" in the Andaines forest. He was amazed when the animal returned home some time later, strong and totally revitalized. Without resentment, "Rapide" took its master along the waters of Bagnoles where he drank and also got rejuvenated. The spa was born. According to another tale, a very old Franciscan monk who took the waters in Bagnoles found a new astonishing vigour and leapt across the highest rocks above the town, which are still called "Le Saut du Capucin" (Monk's Leap Rock). Another facet of this fascinating place is the Arthurian legend, since Bagnoles and its surroundings are supposed to be Lancelot's country. The village's calendar of cultural events includes a visit of the most famous Arthurian sites. 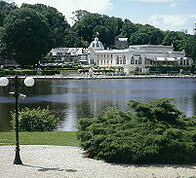 he Beaumont lies on the border of the Spa Park and the 6,000 hectare Andaine forest, near the city centre of Bagnoles de l' Orne and the lake. The affordable and friendly 2-star Beaumont hotel has a very quiet convenient location, close to the Domaine des Thermes. 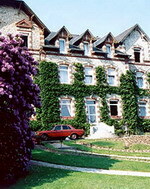 Housed in a beautiful mansion dating back to the beginning of the 20th century, the hotel is made up of 2 buildings surrounded by a pleasant park. It offers quiet rooms overlooking either the park or the nearby forest. Guestrooms feature bathrooms with shower or bath, private toilet, colour TV, direct-line telephone and an alarm clock. 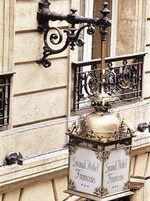 The hotel has its own restaurant where you can enjoy delicious traditional and regional French specialties. It also has a bar, the Twin B that provides a natural meeting place or a quiet place to relax. The hotel does not have its own swimming pool. There is a public swimming pool nearby the hotel. Bayonne is a city and commune in south-western France at the confluence of the Nive and Adour rivers, in the Pyrénées-Atlantiques department, of which it is a sub-prefecture. 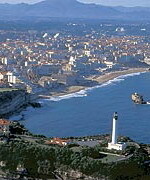 The communes of Bayonne, Biarritz, and Anglet have joined into an intercommunal entity called the Communauté d'agglomération de Bayonne-Anglet-Biarritz. Bayonne is the main town of Labourd and it is part of the French Basque Country. 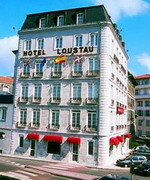 Located on the banks of the Adour River with an exceptional view of the medieval town of Bayonne, the hotel Loustau is the perfect place for discovering the Basque country.All of the 45 rooms are soundproofed and air-conditioned, equipped with modern en suite facilities and include central heating and flat-screen TV.Each of the hotels five floors is serviced by a lift. On the ground floor, there is a restaurant and bar. Le Clos St. Esprit welcomes you to enjoy tasty cuisine made with the freshest ingredients. LEscale offers a cosy ambiance for a relaxing drink.The Hotel Loustau is easily accessible from the A63 motorway. 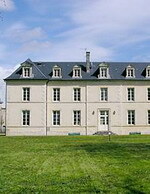 It situated just 50 metres from the train station in Bayonne and just 200 metres from the historic city centre. Also very close is the airport and the Spanish border. Located in the heart of the old town, neighbouring the theatre and the cathedral Le Grand Hôtel, built on an ancient convent of Carmes, welcome you in a cosy and warm atmosphere. A dynamic and international team will cater for all your requirements. Built on two rivers, the city of Bayonne is a fortified medieval city (Vauban fortifications) with timbered houses, some of which date from the 13th century. In this historical city, you'll discover museums, historical buildings and botanical gardens which received the "4 flowers" label. Bayonne is surrounded by 7 prestigious golf courses and health spas (Anglet, Biarriitz, Hendaye, Saint Jean de Luz). The Basque Country offers a large variety of activities : surf, bullfights, jai-lai and cesta punta, traditional festivals, but also music, festvals (jazz, rock and classic) and theatre festivals. We'll be thrilled to help you discover the region. Bergerac is a commune and a sub-prefecture of the Dordogne department in south-western France. The region is primarily known for wine and tobacco. It has 12 recognized wine AOCs (Appellations d'origine contrôlée). Bergerac offers some of the finest wines in the Bordeaux region. The drainage is excellent as a result of its proximity to the Dordogne River. The town has an important tourist industry and features a tobacco museum, in which, ironically, no smoking is allowed. The town contains a statue of Cyrano de Bergerac, subject of a famous play of the same name by Edmond Rostand, though the actual Cyrano never lived in Bergerac. Located in Bergerac, this property is close to Bergerac Maison des Vins. Campanile Bergerac provides a restaurant, conference rooms, a concierge desk, and multilingual staff. Guestrooms have cable television, direct-dial phones, and air conditioning; rooms also include coffee/tea makers, hair dryers, and bathtubs only. Dating back to 1597, Château des Vigiers is an internationally renowned Hotel, Golf & Country Club situated in South West France, just 20 minutes drive west of Bergerac Airport and about an hour's drive east of Bordeaux. Set in 450 acres of stunning countryside, in the heart of the wine districts of the Dordogne, Château des Vigiers offers an exceptional place in which to unwind and relax. Whatever your preference, whether it is touring the world famous vineyards of Bordeaux, playing a few rounds of golf, being pampered at a Beauty Centre or simply relaxing at a romantic hotel and sampling the wonderful local cuisine, our multilingual staff will ensure that your stay will be as enjoyable as possible. Béziers is a town in Languedoc in the southwest of France. It is a commune and a sub-prefecture of the Hérault department. Béziers hosts the famous Feria de Béziers, centred around bullfighting, every August. A million visitors are attracted to the five-day event. The town is located on a small bluff above the river Orb, about 10 km (6.2 mi) from the Mediterranean Sea. At Béziers the Canal du Midi spans the river Orb as an aqueduct called the Pont-canal de l'Orb. claimed to be the first of its kind. 3 star hotel offering 58 rooms. The Mercure Béziers hotel is situated in the heart of the city, next to the Convention center, 15 minutes away from the Fonséranes floodgates and from the beach. 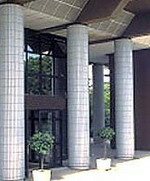 The hotel also features a wine bar, a private parking and services for disabled guests. 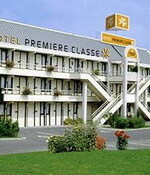 Alongside the A9 and east of Béziers, our hotel is easily accessible from exit 35. 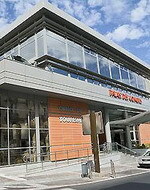 Near the Parc des Expositions and the Stade la Méditerranée (stadium), it is ideally situated for a stopover between Perpignan and Montpellier. The nearest tennis courts are 4 kilometres away, and a cinema can be found within five kilometres. The 72 guestrooms are air conditioned and come equipped with satellite television, internet connections and telephones. Biarritz is a city which lies on the Bay of Biscay, on the Atlantic coast, in south-western France. It is a luxurious seaside town and is popular with tourists and surfers. The town lies in Basque territory, and Basque flags and symbols are prevalent throughout Biarritz. This hotel overlooks the Atlantic Ocean in Biarritz, and is 200 yards from the Grand Plage, and 10 miles from the coastal port of St Jean de Luz. There are indoor and outdoor swimming pools, and guests have access to spa and massage services. There is a choice of three restaurants and two bars. Hotel du Palais' 153 guestrooms are individually decorated and feature high-speed internet access, flat-panel satellite televisions and complimentary toiletries. 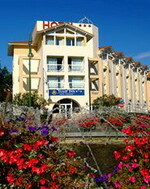 Distance from Hotel to Biarritz-Parme Airport (BIQ), 4 kms (2 miles). Overlooking the famous La Côte des Basques surfers' beach, the Radisson Blu Hotel Biarritz is a stylish and contemporary 4* hotel that offers a warm welcome to both leisure and business travellers. 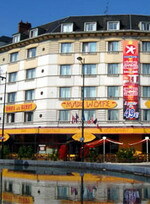 The hotel is a short walk from the town centre shops, nightlife, and Casino, on the sandy expanse of the Grande Plage beach.All 150 spacious, colourful rooms and suites are equipped with high-quality amenities. Free Broadband in each room and wireless Internet access available throughout the hotel. Heated swimming-pool on the large rooftop terrace with a panoramic view of the ocean, town and coastline. Direct and free access from the hotel to the Spa Kémana’s fitness centre. The Spa Kémana is an exclusive concept created by French Rugby player Serge Betsen that offers personalized body care programs (with supplement). 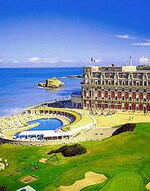 Ideally situated in Biarritz, close to the Palais des Festivals, the city center, the Casino and the beaches. The Louisiane offers an excellent opportunity for those who wish to discover the glamour of Biarritz at reasonable prices in a modern hotel with 77 comfortable sound proofed rooms all with TV (Canal+) and tea facilities. Or relax at the outdoor swimming pool with solarium and terrace where you can sample our season salads and exotic cocktails. Bordeaux is a port city on the Garonne River in southwest France, with one million inhabitants in its metropolitan area at a 2008 estimate. It is the capital of the Aquitaine region, as well as the prefecture of the Gironde department. Its inhabitants are called Bordelais. The Bordeaux-Arcachon-Libourne metropolitan area, with a population of 1,010,000, is the seventh largest metropolitan area in France. The city is among the world's major wine industry centres. Bordeaux wine has been produced in the region since the eighth century. The historic part of the city is on the UNESCO World Heritage List as "an outstanding urban and architectural ensemble" of the 18th century. In the heart of the historical centre of Bordeaux, world wine capital and classified UNESCO World Heritage, the Best Western Grand Hotel Français extends you a warm welcome. You will be seduced by the charm and refined elegance of this former 'Hotel Particulier', or grand town house, with it's typical Bordeaux architecture dating from the 18th century. With its 35 air-conditioned and sound proofed rooms, the Best Western Grand Hotel Français welcomes both business guests and tourists who desire to be at the center of artistic, cultural and economic events of the city of Bordeaux. The Cathedral, the Grand Théatre, the prestigious boutiques, the old pedestrianised streets and the famous 'Place des Quinconces' are monuments and attractions that can be visited on foot from the hotel. The tramway, just a few steps from the hotel, can be used to go further afield. Ideally located in the famous Meriadeck district, the Burdigala is a magnificent boutique hotel in downtown Bordeaux, capital of the Aquitaine region. Only steps away from the historic center, and well-connected to the public transportation system, this luxurious 4-star hotel in Bordeaux offers guests an immediate access to main monuments, museums and trendy boutiques of the city. Thanks to a gourmet restaurant, intimate bar and extensive meeting facilities, the Burdigala represents the perfect solution for guests looking for the best comfort within a friendly and warm atmosphere. With customized services, private car park and state-of-the-art amenities, Hotel Burdigala is suitable for couples, business or older travellers wishing to spend an unforgettable holiday in Bordeaux. From the Citadines Bordeaux Meriadeck Aparthotel, you can step back in time into the history of Aquitaine's capital. The Citadines Bordeaux Meriadeck Aparthotel is located opposite the legendary Esplanade Charles-de-Gaulle, and is a good start point for you to explore the narrow streets of old Bordeaux, or stroll along the banks of River Garonne and St Andrew's Cathedral. Discover the Centre Jean Moulin and the House of Bordeaux Wines in this town that exudes old English-style charm. Historic Bordeaux begins on this great esplanade, closed in on one side by the hotel de Region and on the other by the hotel de Ville. Saint-Andre cathedral and the Fine Arts museum are only 5 minutes away on foot from your Aparthotel. In the narrow streets of the old town that opens out onto the Garonne, you will find the Jean-Moulin centre, the place de la Bourse and the Grand Theatre. Not far from here is the Bordeaux Wine Centre and the famous Esplanade des Quinconces. Bourges is a commune in central France on the Yèvre river. It is the capital of the department of Cher and also was the capital of the former province of Berry. 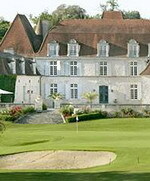 The Chateau de Lazenay is located in the south of Bourges, France, 500 metres from lake Val d'Auron. 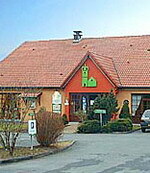 The hotel is five kilometres from St Etienne Cathedral. otel Features. This 19th century chateau is situated between Lake Val d'Auron and a golf-course in verdant, shaded gardens. The hotel decor is classic with a modern twist and features cream painted walls and pale stone floors. Multilingual staff are available for limited hours on the front desk. Wireless Internet access and complimentary parking are provided. Breakfast is served daily for a surcharge. Swimming and canoeing can be enjoyed on lake Val d'Auron. Squash courts, a leisure park, and an 18-hole golf course can be found nearby. Perfectly located, opposite the railway station, right in the town centre. 10 mns walk from the historic centre of Bourges. An unforgettable tour: the visit of the gothic cathedral, a Unesco worl heritage. Fully refurbished with soundproofed and air-conditioned rooms. Hotel open 24 hours a day. In our restaurant, with an original setting, you will savour our varieties of meat, our day menu or our specialities from different countries of the world. Hotel Rooms: 64.